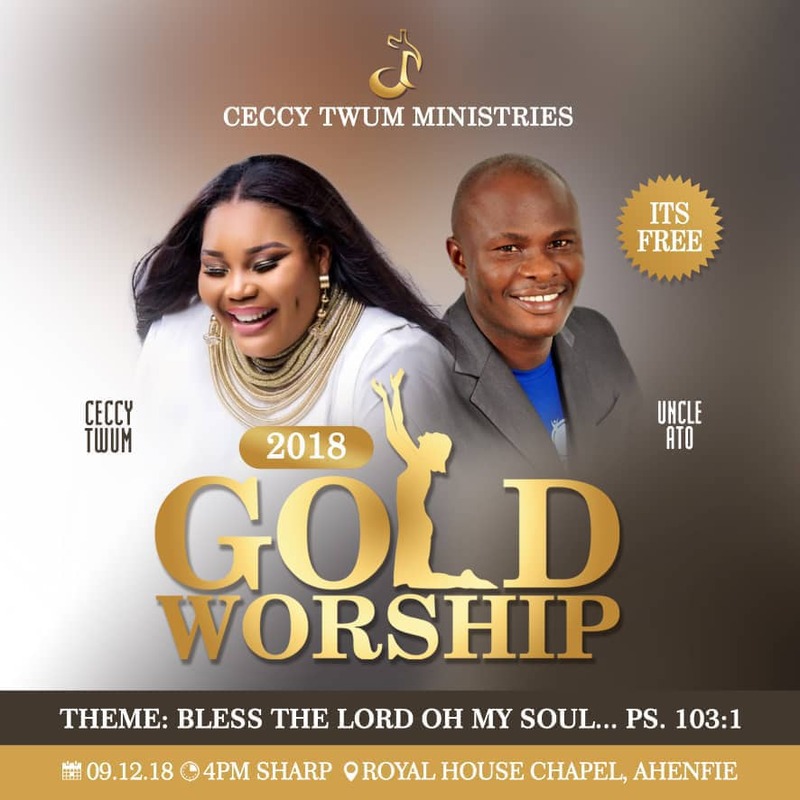 Once again, Renowned songstress Ceccy Twum has set Sunday, December 9th, 2018 for her annual 'Gold Worship' Concert at the Royalhouse Chapel, near Obetsebi Lamptey Circle in Accra. This year's edition is themed BLESS THE LORD OH MY SOUL, which according to her seeks to glorify the name of the Almighty God. Speaking in an exclusive interview with Remedi Entertainment, Ceccy Twum revealed she will rock the stage alongside her choir in an energetic and vibrant atmosphere. The third edition of the programme is expected to also gain support from some selected Ghanaian seasoned gospel music icons such as Ohemaa Mercy, Uncle Ato, Eugene Zuta, Akese Brempong and a host of others. Designed to fulfil the spiritual needs of people, the event is expected to pull thousands of music lovers to the venue to witness the thrilling performances. According to the gospel Artist, the concert is aimed at proclaiming the message that in Jesus Christ there is victory. She added that the ‘Gold Worship’ concert is an annual musical show borne out of the need to create a platform as a way of giving praise and thanks to the Almighty for a successful year. She further revealed that last year’s concert brought unending testimonies on how God used the programme to minister and bless the audience, and they believe a double dose will be administered this year. Ceccy Twum promised to give patrons an amazing performance with her songs like ‘Meko Menim’, ‘Nhyiraba’, ‘Adombi’, ‘Waye Awie’, ‘Awurade’, ‘Medawase’, ‘Awurade Kasa’, ‘Jehovah’, ‘No One Else’, among others.